In his acclaimed memoir Intern, Sandeep Jauhar chronicled the formative years of his residency at a prestigious New York City hospital. Doctored, his harrowing follow-up, observes the crisis of American medicine through the eyes of an attending cardiologist. Hoping for the stability he needs to start a family, Jauhar accepts a position at a massive teaching hospital on the outskirts of Queens. With a decade's worth of elite medical training behind him, he is eager to settle down and reap the rewards of countless sleepless nights. Instead, he is confronted with sobering truths. Doctors' morale is low and getting lower. Blatant cronyism determines patient referrals, corporate ties distort medical decisions, and unnecessary tests are routinely performed in order to generate income. Meanwhile, a single patient in Jauhar's hospital might see fifteen specialists in one stay and still fail to receive a full picture of his actual condition. Provoked by his unsettling experiences, Jauhar has written an introspective memoir that is also an impassioned plea for reform. 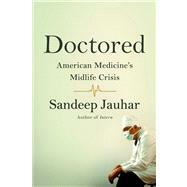 With American medicine at a crossroads, Doctored is the important work of a writer unafraid to challenge the establishment and incite controversy. Sandeep Jauhar, MD, PhD, is the director of the Heart Failure Program at Long Island Jewish Medical Center. He writes regularly for The New York Times and The New England Journal of Medicine. He lives with his wife and their son and daughter on Long Island.